Every 'dog' has it's day! I'm working with archive shots here as I haven't picked up my camera since the accident two weeks ago.. thank you so much for all the love coming this way during this unbearably sad time, hugely appreciated. I'm hoping to get back to posting daily beginning with the CDP theme day on the 1st of August. In the meantime I've been keen to show you two murals by one of my favourite Perth artists Paul Deej who's talent you've seen here many times. The super cool mural above inspired by the 1992 American neo-noir black comedy Reservoir Dogs and below on the corner of Walcott & Learoyd St. in Mt. Lawley the Hollywood starlet Anne Shirley. There's a Deej mural in Fremantle that's high on my 'must capture' list! Hoping to catch up with what you've been up to over the next few nights.. take care and stay safe.. Check out more Monday Murals here..
Today we lay to rest a very special woman, a young mum taken from her family too soon by the cruelest twist of fate.. wrong place, wrong time.. life can be tragically random. Although nothing can replace a mother's love know your children will be surrounded by family who love them dearly both here in the city and in the country. RIP Miranda..
Perth Daily Photo won't be around for a while, we've had a devastating shock in the family, please take care and stay safe..
An ode to my breakfast guests..
'The Joker' by Vincent Fantauzzo.. I took the above shot of the colourful installation titled 'Rapture' by Sydney artist Niki Savvas in the evening a few weeks ago and the below shot during the day last weekend. Known for her visually dazzling installations, the ever changing light bouncing off the multi-colour coded bands of acrylic, reflecting in the glass buildings around and below it are a brilliant addition to the super cool art in 140William. What are you up to over the weekend? I hope to spend much time in the jungle garden, let's see how that works out :) Bon weekend, take care and stay safe..
Visit James to see more weekend reflections.. It looks like winter has finally arrived! After a week of mild temperatures yesterday morning Perth awoke to a touch of frost and a chilly 1C, checking the temps for the week ahead it looks like 18C is the top max.. no rain though and lots of sun, how perfect is that! Somehow it seems the right time to show the outdoor ice rink set up in the Cultural Centre for the school holidays. After a successful first year Winterland is back bigger and better.. I might just have to hire me one of those cute little penguin buddies and get out there, what do you think.. would you like to see that :) Happy Friday, take care and stay safe.. The sun was shining, the birds singing and yet barely a word was spoken at table 48! Although there were two people there were four at the table, two mobile phones that dominated the conversation or lack of.. after an hour both stood, hugged and went their separate ways, what the heck! At Tarts Cafe with friends, the vanilla slice was magnificent, the conversation stimulating and not a mobile phone in sight.. they were there, just not in sight :) Happy Thursday, take care and stay safe.. p.s. crisp, sunny winter days are the best! Too much colour.. no way! Too much colour.. no way! Created during Public2015 this vibrant mural in Bathers Beach carpark, the work of large scale mural collective Too Much Colour could not be in a more perfect spot. Think summer, fun in the sun, harbour, fish & chips, ice-cream, thousands of visitors.. catch my drift :) Bathers Beach House in the background below with it's art deco flourishes is one my favourite buildings in the harbour. I took these shots two weeks ago in Fremantle, our skies have been 50 shades of grey the last few days.. I like it a lot! Happy Wednesday, take care and stay safe.. p.s. I know it's Wednesday, or Tuesday depending :) but hopefully not too late to link to MM! Stop the hate, equal marriage rights.. I was going to go with the title 'Love is Love' but I see Aimee is one step ahead of me :) Slightly different viewpoints of the rally for marriage equality in Northbridge on Sunday. I elbowed my way up on to the podium to get a better view out over the sea of supporters, boys, girls, mums, dads, uncles, aunts, nans and grandads, who despite the rain turned out to make their view known to our less than forward thinking Prime Minister Tony Abbott..we can only hope that at some point he will be man enough to say ok lets put this right. 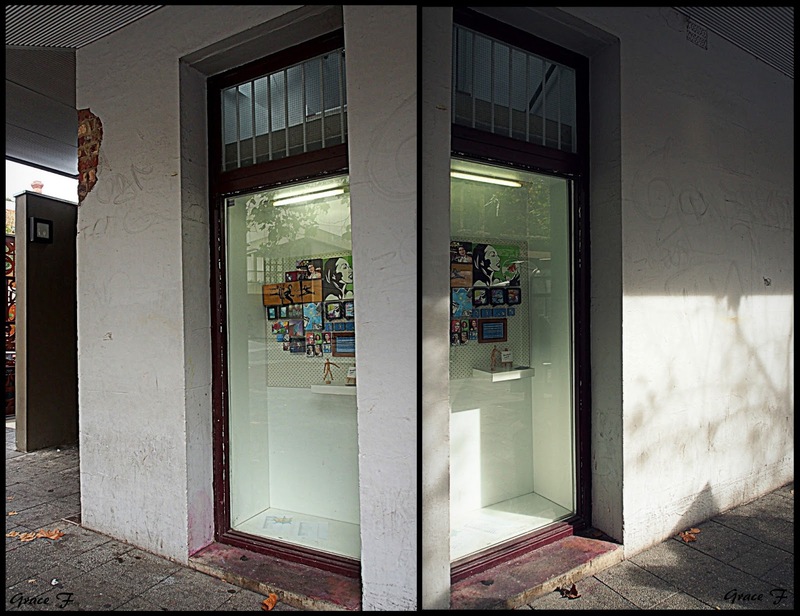 Peek -a-Boo Gallery is a tiny window gallery run by Gotham Studios. As part of Perth City Arts season the Peek-a-Boo is running a series of mini exhibitions the first titled 'Portraits of Perth', above is the 'pop art style' work of my tres talented niece Jessica McCallum. Do you remember my very own piece of Jessica's work Rue des fleurs.. check it out, looks as fantastique now as it did when she painted it two years ago. Pretty cool idea n'est pas! Hope you had/are having a fab weekend, happy Monday, take care and stay safe..
Don't forget your doggie's do-do's! It really is a dog's life! Notice the rather weighty yellow bag the lady is carrying above, mandatory when you arrive at the dog beach with your pooch, leave no evidence behind :) Yesterday was the first time in a while that I've been down to the dog beach and even though it's officially winter it's not all that cold. Was pleased to see that the sand dunes are still being protected. When I downloaded these shots the first thing that stuck me was the mellow light and pale blue sky, as opposed to the almost harsh blue of the summer sky, I like it.. Shake if off.. shake it off! No.1 St. Georges Terrace..five star reflections. Five star reflections! The Duxton Hotel.. No 1 St. Georges Terrace reflected in the ANZ Bank building. Below you can just see the hotel entrance through the palm trees. I don't often taken shots from this end of the terrace, I'm usually up around the top end which if numbers count must be the bottom end as the Duxton is No 1 and therefore the beginning, are you confused yet :) What would John Septimus Roe (below) first Surveyor General of WA think of the terrace now, all those shiny glass skyscrapers.. thankfully there are still many of the original heritage buildings amongst the new, all is not lost! Hope you have a wonderful weekend, take care and stay safe..
Chapel of St. Michael and All Angels..
One of the prettiest churches in Perth in my opinion is the Chapel of St. Michael, the Perth College chapel. Built in 1927 in the 'Perpendicular Gothic style' the tall brick walls and checkerboard design on the parapets and gable ends are tres visually appealing don't you think. Of course I don't even have to mention how much I love the tall arched windows! If you would like to take a peek inside the chapel, under the 'Explore Perth College' click here, menu to the bottom left, facilities, Chapel of St. Michael and guide yourself around this simply lovely chapel. Happy Friday, take care and stay safe.. p.s. can you imagine how pretty the creeper around the door to the chapel and the Agapanthus will be in spring and summer when they're flowering!